ABU DHABI: Pakistan announced to declare their first innings after making a huge total of 670 runs for the loss of six wickets in the final session on second day of the second Test here at Sheikh Zayed Stadium. Now the Australian team, being punished for almost two days from Pakistani batsmen, will play 14 overs till the end of second day’s play. Pakistan’s big total includes magnificent hundreds by veteran batsman Younis Khan, young Azhar Ali and captain Misbah-ul-Haq. 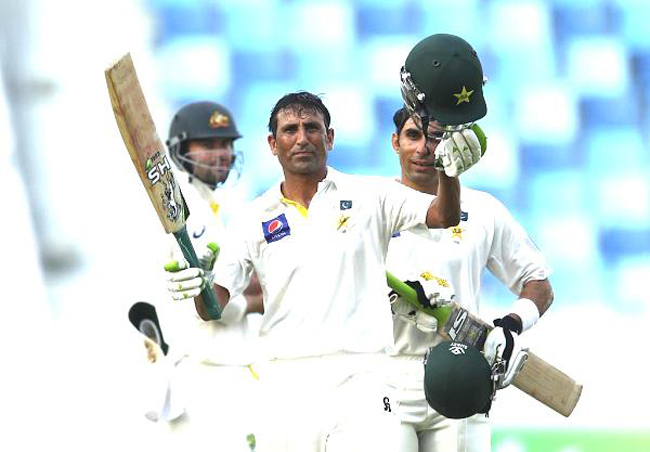 In-form Younis Khan continued his imperious form with his fifth double hundred to pulverise Australia on the second day. He made 213 off 349 balls with the help of 15 fours and two sixes. Younis completed 8,000 runs in his 93rd Test, becoming the third Pakistani batsmen to reach the milestone behind Javed Miandad (8832) and Inzamam-ul Haq (8829). In all, 28 batsmen in the world have scored 8,000 or more Test runs. Misbah also completed his hundred with a reverse sweep off Maxwell, taking 166 balls for the mark before he gave a return catch to Steve Smith. Misbah hit ten boundaries and a six and added 181 runs with Younis to further hit Australia badly. With a big first innings total in sight Pakistan can now hope of clinching their first series win over Australia since 1994. They won the first Test by 221 runs in Dubai. Younis added 236 with Azhar Ali which erased the previous highest third wicket stand against Australia of 223 held by Javed Miandad and Taslim Arif from a 1980 match in Faisalabad, Pakistan. Azhar Ali scored 109 off 250 balls with six boundaries.